Currently amongst the most senior custodians of her country Arparra, in the heart of Utopia, 250 kms North East of Alice Springs, Poly Ngal shares with her sisters, Kathleen Ngal, and Angelina responsibility as keepers of its cultural knowledge. Now in her seventies, she belongs to the oldest living generation of Utopia women and ranks amongst the most accomplished painters who have worked there during the past 20 years. Like many others including Emily Kame Kngawarrye and Gloria Petyarre, Poly began her career in late 1979 creating images in Batik, prior to the introduction of painting on canvas in the late 1980s. Poly Ngal’s paintings often depict bright yellow seeds, a feast for emus, amongst the Bush Plums that grow in her country. Her paintings are borne from traditional knowledge and her confident approach to painting can be seen in the way she assembles streams of seeds, piling dots upon each other to create rich thick fields by employing glowing palettes of colour. Her subject matter is drawn from acute observation and memory, intimate knowledge of country, personal history and ancestral journey. Seamless in her portrayal of these elements her paintings are sensory mind maps that reveal the artist's place, her sense of self, and her worldview all within one framework. Poly’s work has been increasingly exhibited since 1999 since first being featured by Indigenant in Perth and the Desart Gallery in Sydney. She most often paints with her sister Kathleen and most recently has been shown regularly at Lauraine Diggins Fine Art in Melbourne. It is through this association that her work has appeared in the Telstra National Aboriginal and Torres Strait Islander Award, since 2003. 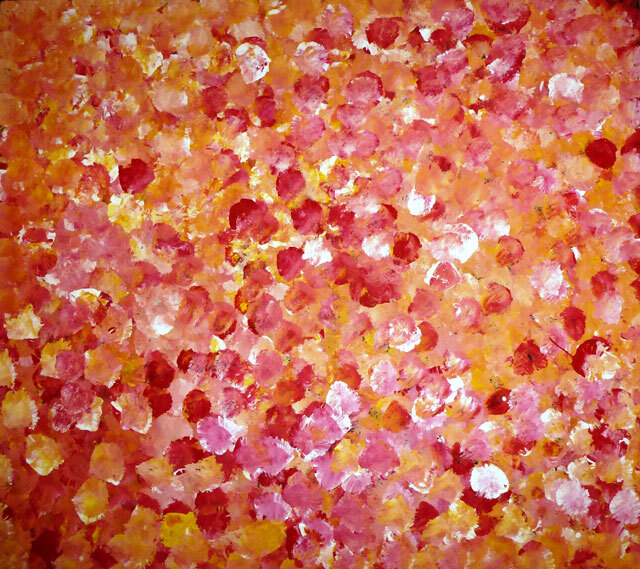 Her honourable mention as a 2004 finalist was followed by representation at the contemporary art fair ArtParis, at the Grand Palais, Champs Elysees, regular exhibitions in Australia throughout 2007, and representation in the exhibition Emily Kngwarreye and Her Legacy at the Hillside Forum, Daikanyama, Tokyo, Japan in 2008. With works in the Holmes a Court Collection, Perth and The World Bank, Washington and references in several books including the important Utopia: A Picture Story, Heytesbury Holdings, 1990, Perth, pp. 102-103 written by Anne Marie Brody, Poly is definitely an artist worthy of any fine collection. Her works have only recently begun to appear in the auction rooms and her ranking is likely to rise sharply during the coming years. This small example created in July 2006 depicts the bush plum (conkerberry) in its various stages of ripening. Her over-dotting style suggests topographical aspects of the landscape and the surrounding vegetation and the changing seasonal nature of the features in the Utopian landscape. Simultaneously the canvas is also a contemporary dialogue or translation of the oldest laws and culture, in a modern language that crosses all boundaries - cultural, geographical, social and religious. Significant in this and other works by Poly Ngal is her cosmic use colour, space and line in celebrating the desert landscape of Utopia. This canvas is created from literally thousands of minute coloured dots whose impact, like softly falling rain, creates fine surface impressions. We see this expressed in the organic waves of energy, that pulsate with shimmering colour and gentle movement.